The art on the cover had me expecting to read about a more grass-roots, Banksy-esque graffiti driven campaign. This is not the case. Still, it’s a great cover. In 1988 Chilean President and General Augusto Pinochet, after a 14-year dictatorship that began with the 1974 military coup which deposed then President Salvador Allende and in an attempt to legitimize his regime in the eyes of Western governments, called for a plebiscite. Citizens of Chile would vote – Yes or No – to Pinochet. “Yes” for Pinochet to remain in power and “No” for free elections. Overcoming the public’s fear of instability, unifying the disparate political parties of the left and withstanding government intimidation the “No” campaign miraculously won. The Days of the Rainbow is Antonio Skármeta’s fictional account of the making of that historic No! campaign. The film NO by Chilean director Pablo Larraín is an adaptation of Skármeta’s unpublished play El Plebiscito, on the same subject. These are works of historical fiction. The book and film not only stray from the historical record – they differ significantly from each other. The Days of the Rainbow (the novel) features two protagonists. The first, Adrían Bettini, is a well-respected but unemployed ad executive who has been blacklisted by the Pinochet government. He is middle-aged, happily married with an 18-year old daughter. At the beginning of the book Bettini is approached by representatives from both the Yes! and No! and asked to head their respective campaigns. He, of course, chooses the No! The second protagonist is Bettini’s daughter’s boyfriend, Nico Santos, who provides a first person narrative to his version of events. In the opening pages Nico’s father, a high school philosophy teacher, is arrested and disappears like thousands of others detained by the Pinochet government. These disappearances had become so commonplace that his father (who Nico refers to as Professor Santos as he is also his teacher) had discussed the possibility with Nico – dividing it into two possible scenarios. … Professor Santos and I had foreseen this situation. We had even given it a name: We called it the Baroque situation. If they took Daddy prisoner in front of witnesses, that meant they couldn’t make him vanish like they did to other people, people who are put in a bag with stones and are thrown into the ocean from a helicopter. There are thirty-five students in my class and we all saw with our own eyes that they took my father. He says that that’s an optimal situation, because they won’t kill him. In cases like this, he’s protected by the witnesses. … If they had made my father disappear without any witnesses, we would be facing the Barbarian syllogism, and I would’ve probably died already of sadness. After Professor Santos is taken Patricia and Nico are instrumental in helping Patricia’s father develop the No! campaign. They help Bettini to understand that he needs to incorporate joy, laughter and even silliness for the No! to succeed. The Days of the Rainbow is a completely engaging novel, easy to get lost in. The prose, translated by Mery Botbol, is light and simple as is the story. Young love, silliness, good overcoming evil, hope – all of these are present. Like Robert Ampuero’s The Neruda Case (which would pair nicely with The Days of the Rainbow) the goal here is as much to entertain as to educate. The character of Guzman fills the same role as the random government official who initially approaches Bettini to work for the Yes! campaign in The Days of the Rainbow. He is both friend and enemy , and a far more complicated character than our heroes Bettini, Nico and René. Opportunistic is to crude a way to characterize Guzman’s and the official’s motivations. Pragmatic too kind. The Atlantic has a wonderful interview of Genaro Arriagada, the true head of the No! campaign. Arriagada discusses the inaccuracies between the film and actual events. He does so without malice or censure. As in everything in life, authors writing historical fiction must pick their battles. The facts (for example – neither book or film mention that American consultants were involved in running focus groups that resulted in the campaign slogan “Joy is coming”) are subjugated and characters merged and simplified to illustrate larger ideas the author wishes to express. We, as readers, must accept that for Skármeta the individuals involved are not so important as what the movement meant to Chile. And that different mediums require different formulas. It’s not surprising that the book, the film and the facts do not entirely line up. I’d argue that the similarities rather than the differences in the two interpretations Skármeta has given us serve to highlight what truly matters: the plebiscite as a historic event; that hope for a future without Pinochet was marketed to the Chilean public as a product (like a brand of soda or a microwave); and most importantly, that when the Chilean plebiscite was over those who voted Yes! and those who voted No! went back to their joint lives without incident. The results stood. There were no riots or (as far as I my research went) retaliations. Those who were in power adapted and adopted the platforms necessary to remain in positions of power regardless of regime change. Everyone else went back to their daily lives. Democracy in action. A government changes without too much disruption to anyone’s day-to-day life. Even the politicians’. In 1989 Patricio Aylwin, who had opposed President Allende once upon a time, won the election and became Chile’s new president. In 1990 Pinochet stepped down but remained Commander-In-Chief of the Army for eight more years. Despite the overall upbeat tone of the book and the “thriller” character of film, Skármeta isn’t afraid to show some cynicism. And why not? We are talking about politics. On September 6th a documentary on J.D. Salinger, called simply Salinger, will be released in theaters. For Salinger fans this is a big deal. The television rights have already been sold to PBS. A book full of photographs will be in stores September 3rd. Those attending advance screenings of the film, or who have been given access to the book, have signed non-disclosure agreements. Of course, tons of information has leaked out. (You have to wonder how Salinger managed to keep his secrets for decades, when the Weinstein’s couldn’t manage it for a few weeks). That Salinger was in the intelligence service during WWII, possibly suffered from Post Traumatic Stress Disorder, was a jerk to the women he dated (well, that wasn’t necessarily news) and that we may be seeing new works in the next 5 years – has all been revealed over the past weekend. So I’m looking forward to seeing the actual film next week if only to find out what surprises – if any – are left. Reading The Cather in the Rye was not a world altering event for everyone. 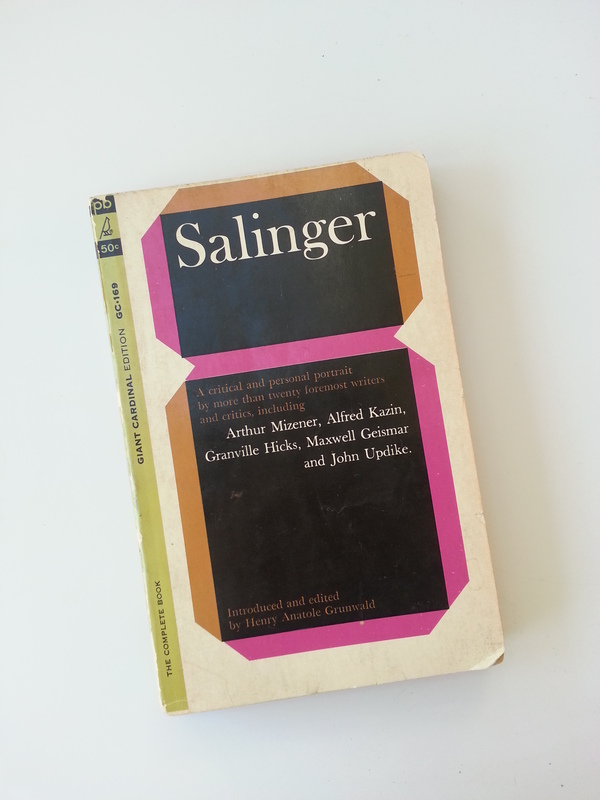 Some of us prefer Salinger’s short stories – particularly those about the Glass family. After reading Nine Stories; Raise High the Roofbeams, Carpenters and Seymour: An Introduction; and Franny & Zooey I was so enamored that I spent a ridiculous amount of time trying to get my hands on anything he’d ever written. What did I discover? That there wasn’t much out there to discover. Some uncollected short stories on microfiche at the New York Public library; a copy of The Way of the Pilgrim (the source of the Jesus Prayer that Franny takes up in Franny & Zooey); In Search of J.D. Salinger, a.k.a. – Ian Hamilton’s Hail Mary attempt to see a return on years spent researching the Salinger biography he wasn’t allowed to publish; and a small 1960’s paperback collection of essays on Salinger’s work (more on that later) discovered in a second-hand shop. I had and have no interest in reading Joyce Maynard’s memoir. I’m still on the fence regarding the book written by his daughter. I also haven’t read Kenneth Slawenski’s 2011 biography J.D. Salinger: A Life, which came out long after I’d resigned myself to waiting patiently for the subject’s death. * (I made the calculations… being 55 years younger than Salinger, barring a horrible accident, the chances were pretty good that I’d live to see the posthumously published works). And, anyway, I was never really interested in learning about J.D. Salinger the man. I wanted more of the Glass family. The 1963 collection of essays, edited by Henry Anatole Grunwald and entitled simply Salinger: A Critical & Cultural Portrait, is the book which provided the foundation of my Salinger research. Originally published by Harper & Row in 1961, mine is the small Pocket Books paperback edition. It includes a number of essays published by the likes of John Updike, Alfred Kazin, Joan Didion and contains an introduction by the editor. It was from this little book that I learned about Hapworth 16, 1924, the last short story Salinger ever published. It’s a strange little story (which I can’t imagine the magazine agreeing to publish if the author hadn’t already received so much critical attention) that takes the form of letter home from camp written by a young and precocious Seymour Glass. Salinger: A Critical & Cultural Portrait also contains the TIME magazine article which states that “a friend reports that Salinger intends to write a Glass Trilogy” and provides a brief overview of Salinger’s military career – a period Slawenski’s biography seems to have covered and the new documentary expands upon. Less exciting (for me) was the information that the Caulfield family had a cycle of short stories, similar to the Glass family which were cannibalized and consumed by The Catcher in the Rye. There are about four of these – two only accessible to the public through Princeton University Library – and they all seem to contain major discrepancies from the final novel: name changes, variations on the cause of Holden’s younger brother’s death (heart condition, drowning, and finally leukemia) and some timeline issues. For Salinger the two families, Glass and Caulfield, were a constant work in progress. He couldn’t let them go. The fact that Salinger continued to write in isolation shouldn’t be a surprise to anyone with even a passing interest in the author. The real surprise would have been learning that after all these years of waiting he had left behind no manuscripts whatsoever. Or that he’d left instructions to burn the manuscripts. *shudder* Rumors of his continued work have been persistant. Even my little 1963 paperback mentioned House of Glass – the supposed working title for the epic Glass family history that’s apparently been years in the making. So the New York Times article published over the weekend regarding the release of new works between 2014-2020 is mildly exciting – but for those of us who have been waiting patiently it raises a lot of questions. If David Shields, Shane Salerno and Slate.com are to be trusted, and there’s no reason at this point to believe otherwise, we have confirmation that there are 5 books and instructions as to when they are to be published. And that among these manuscripts is a novel The Family Glass. But how much of the work will be entirely new? Is this novel a re-working of the early Glass stories – like what happened with Caulfield stories in the writing of The Catcher in the Rye – or a continuation? We’re also told that there will be more stories featuring members of the Caulfield family. We’re told definitively that these will include new stories, as well as the re-packaged older stories. Have the continuity issues been resolved or will they be preserved? Which leads to the next logical question: who will act as editor? Considering most of the famous short stories were published in The New Yorker and edited by William Maxwell this is of real interest to fans. Or it should be. OK, I lied. This is all more than mildly exciting. It’s been three year since J.D. Salinger died and I’m still making mental calculations. If the timeline is right I’ll be under 50 when the last of the new books is published. Hapworth, 16, 1924 appeared in The New Yorker close to a decade before I was born. I’ve been waiting since I was 14 years old for a new book or story to see the light of day. That seems strange. (“Sad!” my husband says, looking over my shoulder). And inexplicable. Because I’ve read better authors. There are plenty of books out there with more sophisticated plots. Yet I continue to love Salinger’s stories. I still want to know what happens to the characters. So do a lot of other people! (I yelled that last bit back at my husband). If you’re one of them I’d love to hear why. Are you planning to see the documentary? Are you Team Glass or Team Caulfield? If you’re looking forward to new books and stories, do you have any expectations? Or do you think Salinger was a big phony? Comments are open below… and it looks like we have at least two more years to fill them. The first group scheduled event for Spanish Language Lit Month is to post on the film Cría Cuervos*. This is an off-kilter and beautiful film starring an adolescent Ana Torrent. The title translates as Raise Ravens, which refers to a Spanish proverb – “Cría cuervos y te sacarán los ojos.” (Raise ravens, and they’ll pluck out your eyes). Set in Madrid, during the final days of Franco’s Spain, it tells the story of one dysfunctional family from the perspective of the middle daughter, Ana. The film opens with Ana finding her father’s dead body in bed, as his lover flees the house. Her mother has only recently died of cancer – after suffering both physically from the disease and emotionally due to her husband’s infidelities. Ana blames her father, played by Héctor Alterio, for her mother’s pain and has mixed a powder she believes is poison into his milk. Now orphaned, an aunt & grandmother arrive to look after Ana & her two sisters. The earthy housekeeper, who acted as nurse to Ana’s mother, completes the household. Cría Cuervos is billed as a “psychological drama”. In the 70’s that must mean minimal dialogue; an indordinate amount of time spent focused on the Torrent’s huge, haunting eyes and abrupt switches mid-scene between reality and Ana’s memories. Snarkiness aside, those are kinda’ the things I loved about it. The main plot line is deceptively simple. The girls have no real concept of what death is. But Saura brilliantly shows how they have absorbed and processed the events taking place around them. In one scene they dress up and amidst much giggling, re-enact a scene they must have witnessed of their parents fighting. In another Ana offers to assist her disabled grandmother die by giving her some of the same “poison” she gave to her father. In a final scene the eldest daughter sums up the feelings of uncertainty, fear and confusion all three are experiencing when she tells Ana of a nightmare from the previous night as casually as if it had no relationship to her real life. More complicated is what the director is attempting to say about Franco’s regime and its legacy to the people of Spain. Ana’s father, we learn, fought beside the Nazis in Germany. There is a sense of decaying luxury within the walls of the family’s Madrid home (where almost all the scenes take place). The swimming pool is empty and neglected. We’re told repeatedly that the house is in disarray. There is Ana’s casual approach to death, which is partly due to her 9-year-old lack of understanding but also serves as a commentary on the atmosphere in which she was raised. She feels no remorse or guilt, despite believing she killed her father. 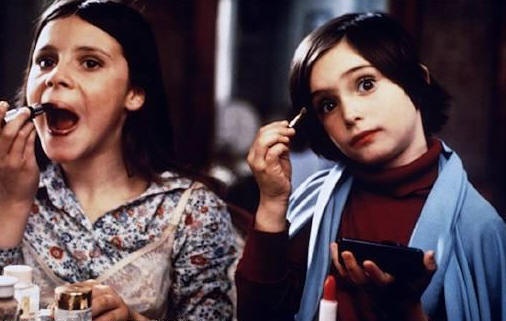 And her older self, who appears sporadically throughout the film to attempt to explain the actions of the younger Ana, no longer seems to have a connection to or understanding of the psyche of the child she once was. What will become of this post-Franco generation, is the question Carlos Saura seems to be posing, who have grown up in strange times with only their parents as examples? 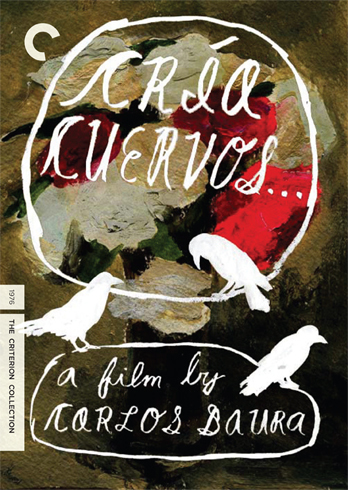 Visually, Cría Cuervos is beautiful – and the remastered Criterion Collection edition I watched was vibrant and crisp. The film’s color palette and the slight awkwardness to the actors’ performances reminded me of a Wes Anderson film. As did the song “¿Por qué te vas?” (Why are you leaving?) which was played repeatedly throughout. One review I read pointed out that in the film Ana’s mother, played by Geraldine Chaplin (who also played the adult Ana), speaks Spanish with an English accent – as does the singer. The adult Ana speaks with a “pure” Spanish accent. The reviewer put forward that the reason Ana repeatedly plays the record is because the singer reminds her of her mother’s voice. Which, to my mind, makes perfect sense. Cría Cuervos is full of small, subtle touches like that. My final review? I enjoyed the film much more than I expected to (I’m not really a fan of 70’s cinema). So much so that I’ve already added El espíritu de la colmena (The Spirit of the Beehive) – an earlier Saura/Torrent collaboration) to my Netflix queue. 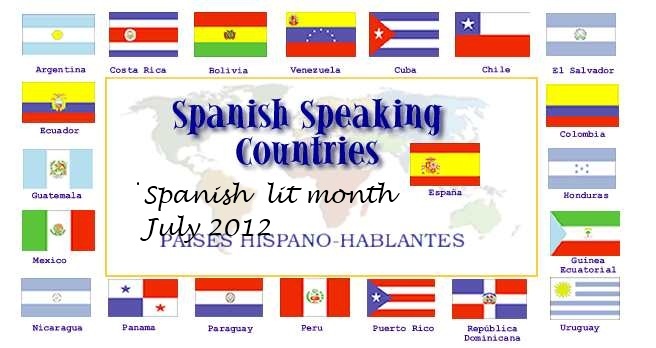 It was, overall, a wonderful way to begin Spanish Language Lit Month. *I’ve posted my review early because I’m a dope who’s never been good at reading directions. You should definitely check out Winstonsdad’s Blog and Caravana de recuerdos this weekend for links to everyone else’s brilliant (and on time) opinions of the film.